Expandable central drying and conveying system for multiple machines. 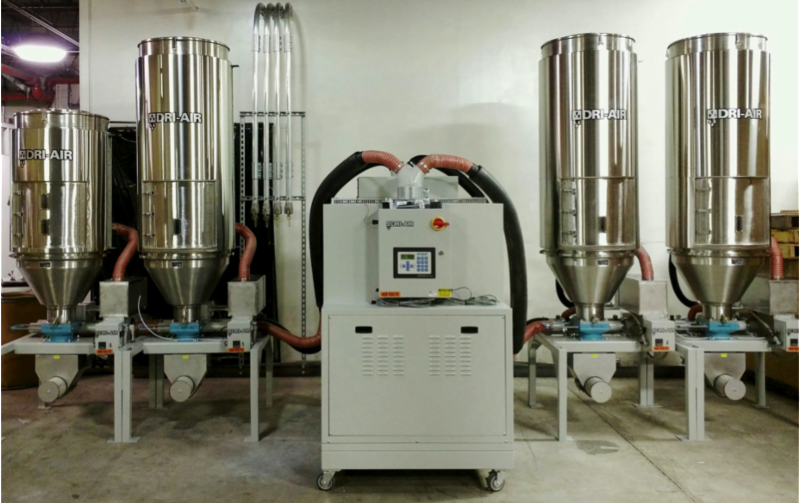 Read about the latest product of the month from Dri-Air on expandable ce ntral drying and conveying systems. Dry and convey to 3 molding machines from any of the 4 hoppers. System expandable for more drying hoppers and molding machines in the future. HP4-X 750 dryer with (3) RH 600 and (1) RH400 hoppers. Hoppers are equipped booster heaters and temperature controllers so you can dry different materials at different temperatures in each hopper. Three position vacuum take off boxes allow you to convey dried material to three different machines from each of the drying hoppers. Southeastern Polymer Machinery Install group (Atlanta, GA) tied the drying system into the plants existing central conveyance system saving install costs and time.